Most of us here at Rockefeller and the Tri-Institutions community, who work in science in one form or another, do so because we love science. Sometimes we are curious about other aspects of science outside of the specific area in which we work. Sometimes we want to talk to friends about exciting areas of research, but it can be hard to explain it to them. Or we may have ideas for an experiment or project, but don’t necessarily have the means in our own labs to carry them out. All of these desires can be fulfilled in a community biolab. What exactly is a community biolab? There doesn’t seem to be an official definition, but it is a growing trend. There are at least a dozen such organizations in the United States, and interest seems to be growing. In broad terms, community biolabs are non-profit organizations that provide lab space, equipment, supplies and training to anyone curious about any aspect of biology. They try to support citizen science and science literacy through this access, and have classes and other types of events geared toward the public. While they do take donations of all kinds, they survive through membership and class fees, so they are dependent on a critical mass of members to survive. As a way to obtain equipment, a community lab in California called LA Biohackers found some old thermal cyclers and a DNA sequencer in the dumpster of University of California, Santa Cruz. There is a community biolab right in New York, in Brooklyn, called Genspace. It was founded by life scientists who wanted to improve the public’s science literacy and support citizen science. They do this through classes, talks and events for the public, and as incubator space for startups, or those who are just curious. Ellen Jorgensen was a scientist working in the pharmaceutical industry when she came up with the idea for Genspace. She was working at a biotechnology company when she saw an article about DIY spaces. At that point, most of these types of organizations were geared toward the computer and electronics industry, but there was growing interest in biolabs. She started lurking on the Google Group mentioned in the article and saw that there was a lot of interest in such a lab in the city, but not much actually happening. In 2009, she sent a message to the group proposing to meet at a coffee shop near the Beacon Theater. Four other people showed up: reporter Daniel Grushkin, artist Nurit Bar Shar, and two Columbia college students. The students were there because they were interested in the iGem competition, but there was no support available from the school. iGem is a synthetic biology competition where participants are given components such as promoters, terminators, reporter elements, and plasmids, and challenged to create a new system within a cell. Bar Shar had learned how to grow cell cultures in fractal patterns and was interested in continuing that work. They started meeting in the Grushkin’s living room, where they would lay a plastic sheet on the kitchen table and Jorgensen would provide equipment, such as a gel apparatus from her job. In this makeshift lab, Jorgensen says she was impressed with the reactions of others and began to “appreciate the privilege to work with the tools of science.” However, working in the apartment, they realized that they couldn’t store any of their work or forge any long-term projects. Then they heard about the Metropolitan Exchange Building at 33 Flatbush Avenue in Brooklyn. The building’s owner was very passionate about using the space for promoting science. The building also housed an architecture firm, Terraform One, that was playing with the idea of constructing buildings from living materials. This concept failed to eventuate, so the architecture firm gave the space to Genspace in 2010, even building a biosafety level 1 lab enclosure for them. At this point Genspace became a non-profit, starting the lab with equipment donated from Jorgensen’s old company. Genspace offers several different types of events. There was the art exhibit, Stranger Visions, where an artist took chewed gum, cigarette butts, and hairs found on the streets of the city, used them to sequence the DNA of these individuals, and from that created busts based on how these people might look. It was meant to be a statement on biological surveillance and how genetics determine how we look. The artist did all this work at Genspace. There are adult classes, such as how to make paper and textiles from bacteria, how to make paint from glowing microbes, and also the occasional book signing. In the past, they have offered classes in basic molecular biology techniques and one on the new gene editing method, CRISPR, which has recently received a lot of press. There will be a lecture by Chris Mason of Cornell University on designing genomes. 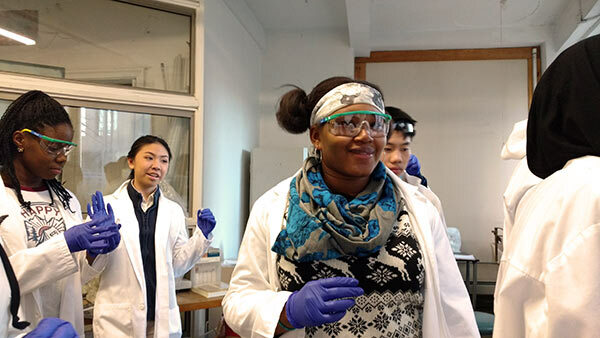 The BioRocket Internship is an after school and summer program for New York City public high school students, giving them a chance to obtain lab experience. Membership costs $100 a month to have access to the lab, and is open to anyone, following an initial safety class. It can be used as a space for scientists to do their own thing. For example, a company called Opentron actually started at Genspace, by a group from New York University that found pipetting repetitive—as bench scientists can attest to. They developed an automated pipettor with intricate software that costs less than $5,000, and formed a company that is now comprised of about twenty employees in the U.S. and China. Membership at Genspace is also “good for proof of concept work,” Jorgensen notes. Genspace has been hosting iGem teams over the years as well. Recently, Genspace has given rise to an even more wonderful organization, Biotech Without Borders. While Genspace continues to focus on the intersection between science and art, Biotech Without Borders focuses more on opportunities for hands-on science. The mission of Biotech Without Borders is to help improve the public’s understanding of biology and DNA technology as a way to encourage democratizing science, provide space for a curious public, and maybe to eventually help bring biotechnology to developing countries. There are periodic lectures and classes on such topics as biotechnology, synthetic biology, and techniques, that are very reasonably priced. They have a recurring free event called PCR and Pizza, where one can bring some organic material that they were curious about, and have it sequenced, or you can sequence a piece of your own DNA, or just engage in conversation about science. There are plans to start a program called Hack the Helix. Intended for city public high school teachers, the program will provide an affordable opportunity to learn biotechniques to present to their classes. There will also be a program for high school students. Biotech Without Borders plans to collaborate with Know Science on some events. For information on specific events at Genspace, go to www.genspace.org. To learn more about what Biotech Without Borders, go to www.biotechwithoutborders.org. You have probably heard the term concussion thrown about in the news lately, as well as in ads for the recent movie with the title. With all the talk, should one be worried about playing contact sports themselves or for their favorite professional athletes? It turns out there is not much actually known about the long term effects of one or more concussions. It has been determined that people who have had multiple concussions often develop Chronic Traumatic Encephalopathy, or CTE. Over time it can lead to several cognitive and behavioral problems, which may be fatal. While there is no current treatment, research is being done on how to treat and prevent this condition. What exactly is a concussion? The terms concussion, traumatic brain injury (TBI) mild traumatic brain injury (MTBI) and CTE are often used interchangeably. 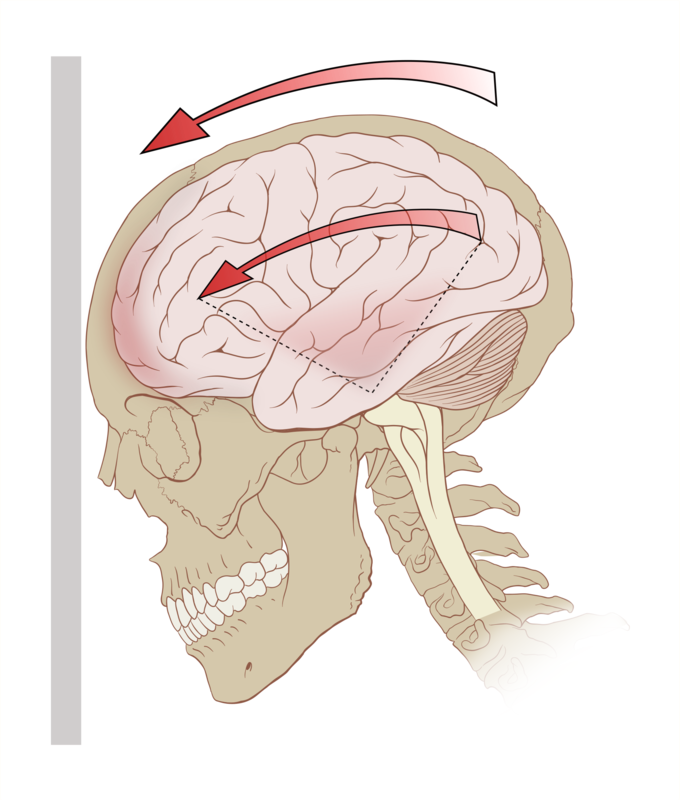 Concussion and MTBI, refer to some temporary loss of brain function caused by some impact force on the brain. The brain literally hits against the skull. This can be from a direct force, such as a hit to the head, or an indirect force, such as a blast wave or a whiplash type movement. CTE is the condition when a protein, called tau, builds up in brain cells and causes progressive deterioration of brain tissue. There are various symptoms that can signal a concussion immediately after one receives a blow to the head. One can be confused, irritable, dizzy, or lose focus, balance or motor control. They may have vision problems such as double vision or light sensitivity, tinnitus or ringing in the ears, and loss of memory of the event that caused the concussion, nausea, or headache. CTE is caused by multiple concussions over time. These patients can develop memory problems, slowed mental processing, slurred speech, tremors, impulsive and aggressive behavior, and depression. At this point, CTE can only be diagnosed definitively by microscopic examination of brain tissue during autopsy. The symptoms can often mimic those of neurodegenerative diseases such as Alzheimer’s, Parkinson’s or Amyotrophic Lateral Sclerosis (ALS). Symptoms can start anywhere from 6 to 12 years after exposure. Since the 1920s, it’s been known that boxers often would develop cognitive problems and dementia over years from hits to the head. The popular term is punch drunk. Medically, it is known as dementia pugilistica. No one thought to look at other professions for this condition. When football first became popular in colleges in the 1880s, players used leather helmets. Eighteen players died from injuries at that time. This led to some rule changes and to the use of better equipment to protect the players. In the past, the practice was to ask if someone was experiencing any symptoms after being hit on the head. This relied on the patient reporting symptoms. However, there was a popular belief that one should play through the pain. It is thought that many athletes probably received multiple concussions, leading to CTE. In 2005, a Pittsburgh forensic pathologist, Bennet Omalu did an autopsy on a retired Steelers player who died at age 50 after experiencing multiple cognitive problems of unknown cause. While there were no gross anatomical changes in the player’s brain, when Dr. Omalu looked at the brain tissue under the microscope, the cells looked like that of an 80-year-old with advanced Alzheimer’s. He found that there was tau buildup in the cells. Protein deposits form structures called dense neurofibrillary tangles, that causes clogging that slowly strangles and kills the brain cells. Tau is a protein that binds to microtubules in brain axons. When tau becomes unbound, neurotransmitters can back up. He found the same thing in two other retired football players, and published a paper on his findings in the journal Neurosurgery. It was these events that the recent movie is based on. Since then, CTE has been found in the brains of 79 percent of 165 other people with a history of playing football, from high school to professional. It has also been found in ice hockey, soccer, and rugby players, wrestlers, boxers, mixed martial arts fighters, military veterans, and even one baseball player. One high school football player died at the age of 18. In CTE, the protein deposits tend to be found in outer areas of the brain, while in Alzheimer’s, plaques of a different protein tend to be distributed throughout the brain. It is not known what the relationship is between impacts on the brain and the buildup of tau protein. At this time, there is no definitive method of diagnosis of CTE in a living person. There is no treatment and it is not known how to prevent this condition. 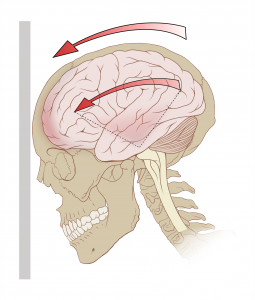 The current medical treatment for concussion is to rest for several days after the impact. There is current research being done to find better ways to diagnose and treat CTE. There is a study being done on a method to use a PET scan with a radio nucleotide tracer to visualize the tau deposits. However, this method is very expensive. An auto antibody, an antibody directed against the brain protein S100B, has been found in the blood of a number of people with symptoms of CTE. Research is being done to see if this antibody could be used for diagnosis, or be a possible target for treatment. There has been a call among neuroscientists for a large scale study of exposed and unexposed subjects, as a control group, that can be followed long term. There are several institutes conducting research on CTE. One is the CTE Center at Boston University, in collaboration with the Department of Veteran Affairs. They have a brain registry for people who want to donate their brains after death. Already 250 NFL players have signed the pledge. The Brain Injury Research Institute in California was co-founded by Dr. Omalu. They conducted the autopsy on Junior Seau, the San Diego Chargers player who committed suicide. His brain was donated to the National Institute of Neurological Disorders and Stroke. The Center for the Study of Retired Athletes is at the University of North Carolina at Chapel Hill. Their studies are funded by the National Football League. The Cleveland Clinic is conducting research on the auto antibodies. Virginia Commonwealth University won a federal grant to conduct research on the long term effects of concussions on military personnel and veterans. When the discovery of CTE was first published, the National Football League tried to deny its validity. Since then, they have made some rule changes to try to protect players from multiple concussions. There is a new rule that makes helmet to helmet blocks a penalty. They now have a concussion protocol that says a player needs to be taken out of the game for at least one play and evaluated by a doctor. The next time you get a good blow to the head, try to take stock of any symptoms. If so, rest for the day and do not go back into the game. Cancer immunotherapy: how to shoot a target moving faster than a bullet? One out of every two men and one in three women will be affected by cancer in their lifetimes. Cancer devastates the people it afflicts, traumatizes their family and friends, and puzzles scientists and physicians who dedicate their lives to understanding and fighting the disease. When President Richard Nixon signed the National Cancer Act of 1971 and declared an all-out “War on Cancer,” many naively believed that cancer would soon be defeated, just as we celebrated our victories against smallpox and tuberculosis. Half a century later, we are still far from winning the war. As the Pulitzer-winning author Siddhartha Mukherjee dubbed it, and as we have gradually learned from endless battles with the disease, cancer is The Emperor of All Maladies. Recent news from the front lines of cancer research suggests that we are gaining ground in the war on cancer. The FDA approved the first antibody immunotherapy targeting CTLA-4 (marketed as Yervoy by Bristol-Myers Squibb) in 2011 and the second, more effective antibody neutralizing PD-1 (marketed as Keytruda by Merck) in 2014, both for late-stage melanoma. In 2013, the journal Science named cancer immunotherapy “Breakthrough of the year.” Since then, cancer immunotherapy has dominated the discussion in the field of oncology and is gradually catching public attention. So what is cancer immunotherapy, and why is it inspiring so much optimism? Simply put, cancer immunotherapy aims to use our own immune system to fight cancer. Before expanding on cancer immunotherapy and its distinction from previous cancer therapies, let’s first understand how cancer acts. Imagine our bodies as a city, where cell types with specialized functions—melanocytes, neurons, epithelial cells, and many others—work seamlessly together to keep the city functional and thriving. One day, a regular cell decided to join a cult called “cancer,” which mandates its members to trespass every law, regulation, and social order to achieve one single mission—conquer the entire city. Gradually, the cancer cells occupy a block, then a borough, and finally invade all parts of the city. When cancer cells enter a new place, they evict existing cells from their buildings, steal their food, tear down their homes, and decimate their communities. Gradually, cancer cells hijack all major resources while contributing nothing to the city. Starved and dismantled, the city has no defense to keep normal cells safe, no nutrients to feed the hungry, no caretakers to nurture the young, and no energy to keep everyone warm. The city is dying. To save the city, and indeed the body, we need to fight the cancer cells. Typically, we first identify the weaknesses of cancer cells and use the most effective weapons to attack them. If cancer cells have a base camp in a block, we demolish every building in the neighborhood or even throw in a small-scale nuclear bomb (similar to surgery and radiotherapy for treating local tumors). If cancer cells have spread across the city, we target the cancer cells’ weak spots, killing most cancer cells while inevitably paralyzing many normal ones (similar to chemotherapy for treating metastatic cancer). We might poison or deplete cancer cells’ unique source of nutrients or sabotage their distinct mechanism of growing, eradicating cancer cells at a minimal casualty on normal cells (similar to targeted therapies such as Gleevec that are very effective with negligible side effects). In most cases, these coarse offenses work well initially but slowly become ineffective as cancer cells mutate to fix their weakness and learn to look like normal cells, making them “invisible” in our body. At this point, any weapons would do as much harm to normal cells as to cancer cells, and we are doomed to defeat.